(L-R): Alex Forsythe, territory sales manager; J.R. Johnson, territory sales manager; Steve Porteus, vice president sales; Ron Poltorak, territory sales manager; Corey Rogers, HCEA marketing manager; Lee Lassiter, Fort Pierce operations manager; and Howard Abel, vice president sales and operations manager, celebrate the expansion of Hyundai Construction Equipment Americas’ North American authorized dealer network. Hyundai Construction Equipment Americas has announced the expansion of its North American authorized dealer network with the addition of Earthmovers Construction Equipment. Earthmovers was founded in 2013 and has recently become a part of the National Equipment Dealers (NED) Group of companies. 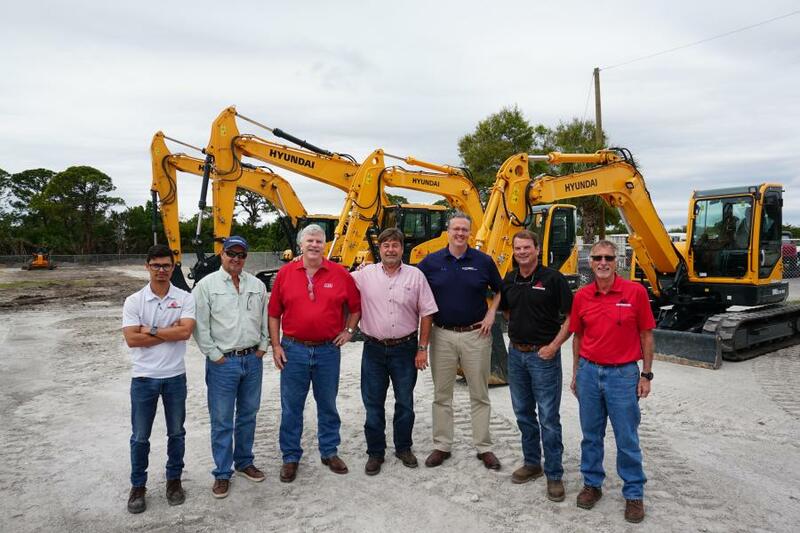 Originally based in Stuart, Fla., Earthmovers has grown significantly by adding a new branch in Fort Pierce and a second location outside of Orlando. Both facilities provide equipment sales and rentals, fully stocked parts departments, and factory trained service personnel in the shop and on the road. "HCEA is pleased to announce the addition of Earthmovers Construction Equipment to its North American Dealer Network," said Shaun Galligan, HCEA district manager-southeast. "With their two locations in central and south Florida, their years of experience in the industry, and the support of the NED group behind them, Earthmovers should hit the ground running and help HCEA continue to grow its Market presence here in North America." With the addition of this new dealership, Hyundai's North American network now includes more than 70 dealerships operating in just over 150 locations, offering sales, service and parts for the full line of Hyundai excavators, wheel loaders, compaction rollers and other construction equipment.